Some years back, my wife and a few of her friends on Multiply (an old social media and blog site predating things like FB, Blogger, etc.) started a "Chicken Tuesday" set of blogs. Originally, it was intended to share recipes for that venerable staple of the world's table, but then people like me got involved. A lot of people. At one point a national morning show even started saying something like, "Have a great Chicken Tuesday." I'm not one to disparage recipe sites, but on the other hand there is so much one can do with them in a humorous bent that I sometimes can't resist temptation. Since parody is one of my favorite forms of humor, I created a "news" piece for their consideration. I did it extemporaneously, which is a great exercise to sharpen one's writing skills. Just for giggles, I thought I might re-share it here. United Peepers International (UPI) reported earlier today that Chicken Tuesday, purportedly an innocent and fun internet blog effort, is, in fact, a front for Kentucky Fried Chicken. UPI has received reports that the Colonel has been spotted with Elvis visiting chicken roosts in Arkansas and elsewhere. The Colonel, long believed to be dead, is apparently alive and well and looking to spice things up in the restaurant business. The office of Farmland Security has raised the threat level to red during this extreme crisis, cautioning all of Cluckdom to take extra precautions for the foreseeable future. If possible, fly the coop and seek shelter in a forest. All of our readers unable to fly the coop are cautioned to remain indoors if approached by any humans, attempt to make yourself look undernourished, and stay clear of large crowds. Details were sketchy, police say this was a private matter, and young Johnny is still a juvenile. Master Brown will be arraigned before a Kangaroo Court Conviction and sentencing is expected to be swift. “We were caught completely unaware by the news,” sputtered Rocky Strutter, head of the local AFL (Affiliation of Feathered Loudmouths). The two local labor leaders were commenting on the news that, once more, their morning chore was going to be replaced by alarm clocks due to the implementation of Daylight Savings Time. Both leaders threatened a strike, however the AFL/CIO International Headquarters issued a statement calling the point “Mute,” yes, that’s “mute” not “moot,” since all union members are required to stay in bed, fast asleep until the eastern sky begins to brighten. “There’s just very little we can do about it,” a Union spokesman declared. Crowing before dawn is just unheard of.” He downplayed threats of empty nests. He was heard muttering, “Talk about your Shanghaied Roosters...” as he walked from the podium. Latest polls are giving the edge to Bwaack Obama in this chicken nation’s race to see who will be the chief executive clucker. Bwaack is easily outdistancing his liberal ticket opponent in the primary, who is reported to be madder than a wet hen and is now employing barnyard tactics to sway the vote in her favor. Remember... get out and vote... ‘EM ALL OUT. Life and a long career have taught me a thing or two. One of the most important of these lessons came early and has proven valuable regardless the direction of my endeavors. That lesson is discipline. I’m not talking about punishment, counseling, or any of the myriad of other ways authoritarians impose their rules and their will on people. I’m talking about mental discipline. When I read blogs or comments discussing motivation, procrastination, writer’s bloc, interruptions, distractions, and similar writers’ complaints, my first thought is, “Are those folks disciplined?” Probably not, or at least not disciplined in their approach to working at writing. Being disciplined means being organized. Mentally organized. It’s okay to have a messy desk, provided it isn’t so messy you can’t find things you need to write, like notes, references, and so on. Why is mental organization necessary? Simple. It means you organize your thoughts and approaches to getting things done. Organized thoughts are easier to retrieve. Think of that as a mental hard drive. If documents are randomly stored without a proper file system, you will spend a lot of unnecessarily wasted time trying to find the one you need to access. As a matter of fact, one of the tools to gaining mental organization is to organize your documents into files on your computer, laptop, or tablet. Like mental organization, you will find that it is far easier to start with a fundamental filing system and grow it than it is to try to build one after accumulating years of documents. I can hear all of the creative procrastinators right now as they look at their unfiled documents. “I need to write, I’ll get to this tomorrow.” No they won’t, but this is where the discipline part of organization comes in for those who want to kill the procrastination bug. Never put off until tomorrow what you can do today. If you haven’t done any file organization, here’s a simple approach for filing word processing documents in descending order. Writing [main file] - This separates your writing files from all other files on your computer. Title [sub-file] - This separates your work by working title. Research [sub-sub-sub file] - This separates supporting documents gathered on the Internet of scans specific to this title. Notes [sub-sub-sub file] - This is where the writer’s general notes, plot lines, devices, etc. go. Draft [sub-file] - All drafts and edits go here. If there are illustrations or pictures, create a sub-sub file for those under this sub-file. Final [sub-file] - The final submission document goes here. If you have designed your own cover, include the final version in this file. Conversion Files [sub-file] - e-book converted files go here. Some writers use programs to help them organize their thoughts and writing. Scrivener® is one option. I recently purchased this program and when I finish the two books I’m currently working on, I intend to give it a try. That isn’t procrastination, is it? Alright, now you have your files organized. Ahhh, done, right? Not so fast. That’s only part one of the approach to discipline as a writer. Remember all those other issues... motivation, interruptions, distractions, and so on? There is a way to minimize those using a disciplined writer’s approach. Organize your day. That’s right, create a schedule and stick to it. This will vary on an individual basis, and depends on one’s personal circumstances, but if a writer is serious about the desire to complete and publish their work on a consistent basis, this is a job. Perish the thought! Journalism is a job. Writing is creative art... writing is passion... writing is... I’ve heard them all, and while true, if the writer intends to profit from that creative art, this is a job. Jobs, even joyful ones, run on a schedule or they don’t get done. Schedules, however, can’t be inflexible. Sometimes another of life’s priorities takes precedence. Family emergencies, for example, can’t be predicted, but I will guarantee you they will trump a writing schedule every time. Personally, I don’t consider a boo-boo on Johnnie’s little finger an emergency, but others are. For example when my oldest child at age six decided to open a cheap pocket knife someone had given him, cutting himself in the process, I took a break from the schedule. It wasn’t that the cut was so bad, but the running around and hand shaking in the breeze made the walls he passed look like a murder scene. That’s an emergency! Barring those sorts of things, stay with the schedule, it will serve you well. Since I can’t write a schedule that will fit everybody (one size does not fit all), let me lay out mine for you. Mind you, I work on multiple projects, and my actual schedule is complex, so you get the simplified version. My start times aren’t included because, well, I’m semi-retired and they change from time to time. I’ll provide durations, though. Let’s assume I have risen and eaten breakfast, and done all the other things one takes care of in the morning. Here’s how my typical day works. 1. Review email and take care of phone calls. 1 hour. 2. Review social media and read and respond to comments. 1.5 - 2 hours. 3. Editing (includes others' works).1- 2 hours. 4. Meal break. 1/2 hour. 5. Writing/researching (own works) - 1-4 hours - varies with deadlines, but never lower than 1 hour/day actual writing. 6. Family time and “me” time. My typical “work” day lasts eight to nine hours. Part of that is old habit, part is necessity. Still, I have enough flexibility to work only half days when the mood strikes me. For me, this is an everyday schedule. I only abandon it when I go on vacation, and even then, I tend to write in the evenings on my laptop. Writing is a passion, yes, but it is also a discipline, and the serious writer is a disciplined writer. Like most people, my life experiences are varied, their only common thread is, well, me. As an author, that provides me with a significant amount of literary fodder accumulated over six and a half decades of life. Like most authors, it is the telling of the tales, the crafting of the words, the sinews of the plots that interest me. Like most authors, I found that publishers tend to want to pigeonhole your efforts. Write only one genre. Get known. Exploit it. Define a readership... a following and feed the beast that feeds you. In short, be creative, but not too creative. A statement that makes my blood boil came from an agent, “I liked the book, but you need to rework it to read more like...” and named a best selling author. Essentially I was being told to use a writing formula, and not just “a” writing formula, but one that has been used by a successful author. I’m convinced that is the reason so many genre books are so predictable in terms of plot, characters, and language. Basically, most are the same book, structurally speaking. Pigeonholing can certainly focus an author’s efforts, but it limits the author’s range. Why limit oneself to a single genre unless you choose to do so? Who’s to say a mystery writer cannot be equally adept at adventure, thrillers, or even children’s books? If you think about it, had some of our greatest minds limited their efforts, the Renaissance would never have happened. Imagine if the Medicis had told Da Vinci, “You are an inventor. Sorry, but we can’t support your painting. Architecture? Forget about it. Science? Stick to inventing.” Imagine the Pope telling Michelangelo, “You’re a painter, leave the sculpture to the stone workers.” Using the single genre approach, we would never have had anything but war stories from Hemingway. We would have missed Under Kilimanjaro, A Moveable Feast, The Garden of Eden, The Old Man and the Sea, Hemingway on Fishing, and countless other works. In a business sense, one can fully appreciate the one genre approach to success, but as a creative artist, I abhor it. Were I dependent solely on writing for a living, I would probably embrace it, but since I’ve had a long and successful career doing something else, I am free to define my own path. Not all authors have that latitude. So, how does an emerging author choose which path to take? First, you must be passionate about the subject or subjects on which you intend to write. Passion drives great stories. The greater the passion, the better the tale. Along with passion, you must be knowledgeable about the subject of your story. Even in thrillers and science fiction, suspension of disbelief only goes so far. In historical fiction or adventure, factual inaccuracy or ignorance can be a story killer, so at least be sure you do your research. Even passion and plausible scenarios and plot lines, however, won’t win readers if the writing is poor. So, study your craft, polish your writing, and make sure it is the best it can be before putting it out to the public. Good writing knows no genre boundaries. Okay, we have established passion, good research, and good fundamental writing skills are necessary to creating a book that will stand a chance of success. So now you have a decision to make. Do you choose a single genre or a more varied approach? Part of the answer lies in personal experience. If your life experience is narrow, it might be better to stick to a single genre and perfect your approach. Those with broader life experience may find this a bit confining. A second factor is your personal interests. Some have few, while others have many. Be realistic about using your interests as a jumping off point, though. Interest alone is not enough to launch a good short story, article, or book. Interest must be backed by some level of personal experience and research. Without it, what you write won’t ring true. Believability is critical to good story telling. If it isn’t believable, it won’t hold the reader’s attention. Good writers get involved with what they write about. Please note here that there is a major difference between a journalist/reporter and a creative writer. While it is true that both need good writing skills, the journalist/reporter relies on factual sources for the meat of what they write, while creative writers use facts as a path to believability. Creative writers weave facts into the fabric of the story, but the facts are not the purpose of the story. A third factor is more fundamental. Are you writing for the joy of creation, or to make a living? That, more than anything else, will have an impact on your direction. Nothing channels writing like success, and nothing drives the direction of that channel more than the demand for more of it. Demand is generated by the readers and pursued by publishers. A solid source of readers is essential to continued demand and building an audience for your writing is critical to making a living as a writer. Just remember, readers can be fickle and if you disappoint them, you court disaster. If you are just starting out, experiment a bit. Try writing a few short stories and try them out on friends and other writers (yes, there are some who will read your work, but it is unlikely to be highly successful ones unless you happen to know them). A writer’s blog is often a good way to put your work out there as well, and feedback is often better in that forum. Find what you are comfortable with. Focus on that and hone your skills. Good writing is rewriting. Most writers’ material goes through multiple rewrites, multiple edits, and more rewrites. It’s a process, and it won’t take long for you to determine what direction you want to take. If your best writing tends to focus in a single direction, a single genre approach might be the best choice for you. If you have been around the block a few times, like me, you may find writing in a single genre will drive you right off the edge, and it tends to have that affect on most seasoned writers over time as well. Single genre writing is a bit like an old dirt road. It’s comfortable, but getting out of the ruts can be a real bear. Me? I’m not much for ruts. I write under different names. My fiction appears under S. Bradley Stoner, fact under Steve McCarter, and poetry under Bridgewood. Yes, I know, it’s a bit schizophrenic, but it is my personal way of compartmentalizing my work and a way of distinguishing factual writing from all the rest. It’s my quirk. Other writers handle it other ways. Besides, it helps keep me from getting pigeonholed. 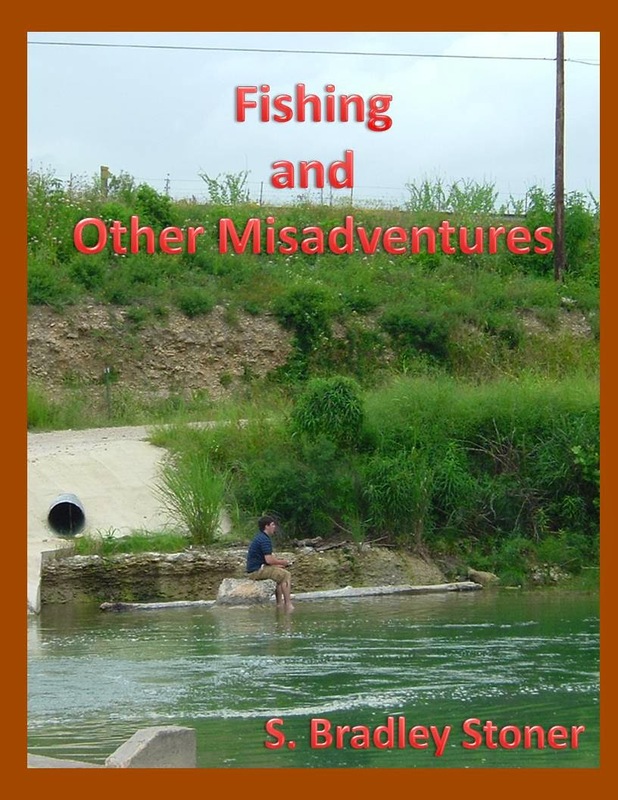 My most recent book, Fishing and Other Misadventures, will be offered as a Thanksgiving special at a price of $0.99 from November 18 through November 23. Don't miss your chance to get a copy at this special price! As a writer, nothing is so annoying to me as reading a book that is rife with errors. One expects to see the odd error in a book, even books that are traditionally published. There is a difference between the odd error, however, and multiple errors. Multiple errors drive readers nuts, even when the plot line and character development are good. So when you are getting ready to self publish that book, be sure to do a thorough review and edit before you put it out there for everybody to see, especially if you want to avoid negative reviews. Here are a few common errors I have noticed in reading self published books. - Omitted words (e.g., "[He]found the strange box in an antique store..."
Poor grammar usage. The only place poor grammar is acceptable is in expressing a character's speech or thoughts. For example, "It ain't my fault she's got no smarts," imparts the vision of a poorly educated individual, and perhaps even conveys a bit of irony. On the other hand, if the author follows that up with a descriptive independent of the character's statement, such as, "Billy hit the nail on the head. Sally didn't have no smarts..." well, you get the idea. Bottom line? Check your grammar, and if you aren't good at that, have someone who is check it for you. Friends, by the way, are rarely good choices for this job, since they tend to be empathetic and don't want to hurt the writer's feelings. Find someone who isn't worried about your feelings. You are trying to put a product before the public, hopefully one that will sell. That takes work and a thick skin when it comes to edits. Learn from the editor and improve your craft and your product. Spelling errors. I see things like "loose" when "lose" is meant,"follow" when "fellow" is meant, as well as words that are just plain misspelled. To address them, you can use a spell checker as an aid, but be careful and don't blindly rely on it. First, you could insert the wrong word from the checker instead of correcting the misspelled word. Believe it or not, that is more common that you might imagine. I have been guilty of that myself, but generally catch those types of errors on the final edit. Also, there are a lot of folks who rely on the Thesaurus for finding alternatives to the word used, which is fine, provided you understand the nuance of the alternative. Some of the examples provided may not fit the sentence in context. It pays to look up any replacement word in a dictionary to be sure of its meaning within the usage context. Continuity and Content errors. If the writer isn't good at timelines, keeping track of plot and character development, things that can go wrong will go wrong. If you're a seat of the pants writer, go back and check your previous chapters often. If you employ a more structured approach, follow your timelines, plot arcs, character charts, and outlines, but still go back and check previous chapters as you write. If you can't do either of these well, seek out a content editor, they will find everything you missed. Once again, failure to pay attention to continuity and content will earn the writer a bad review or worse, no review and no sales. So, take that great idea and your passion to write and go for it, but make sure you take the time and effort to produce something actually worth reading. Without careful editing, the product of the best idea and the greatest passion will fail to realize its potential... unless, of course, it's a book that plays on taboo themes, like Fifty Shades of Gray or is particularly appealing to a set of genre readers. There are exceptions to every rule.